The Tungsten Gamma Ray Collimator is amongst the important components of the industrial radiography set up. This type o f Ray Collimator is especially designed by in a way that provides a kind of radiation safety to the operator and common public by enabling the exposure of the emerging beam of radiation in useful areas. 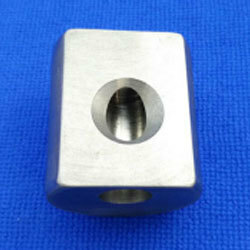 Tungsten Gamma Ray Collimator generally reduces the scattered radiation and can be availed in the specification with length 1.88 in and diameter 1.5 in, Attenuation : Co-60: 0.46 Ir-192: 0.05 Se-75: 5.3 E-3 along with the beam size and half value layers 60ÃÂ° conical side throw and Co-60: 1.12 Ir-192: 4.30 Se-75: 17.5 respectively.